We have so easily settled into this fishing villiage lifestyle that we think we had best move on or we will be tempted to ask about monthly winter rates . . .they actually close our hotel on Nov. 10th. We did go looking for a real estate office yesterday (a tradition in our travels) and couldn't find any - another mark of an authentic place, not yet given over entirely to tourism. So today we head north along the Libyan Sea coastal highway under a cloudy sky and rain falling. We have no destination in mind, will report in when we stop the next time. 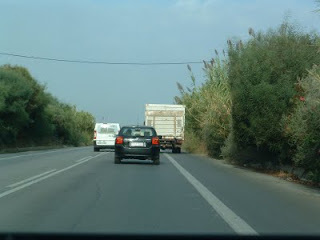 I mentioned driving in Crete and this photo probably says best what I was trying to describe. This is the way you move to the side allowing others to pass - works fine unless they are doing the same thing coming from the other direction!